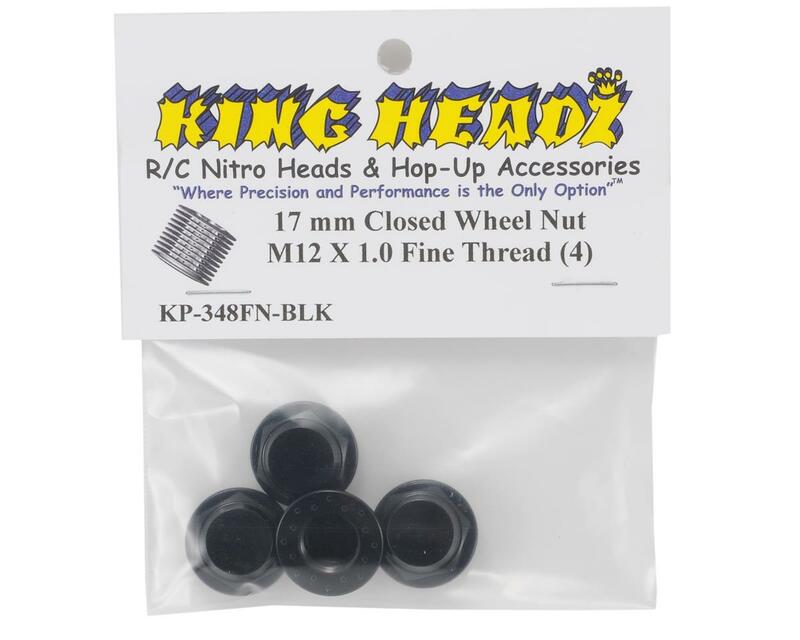 This is a set of four optional King Headz 17mm Fine Thread, Closed End, Flanged Wheel Nuts and are intended for use with Losi, XRay, Kyosho, Hot Bodies, Mugen, Associated or any other fine thread hub (M12 X 1.0). These Flanged wheel nuts are CNC machined from 7075 aircraft grade aluminum and Anodized Black for durability and good looks. These closed nuts are designed to minimize the amount of dirt that gets into the axle. 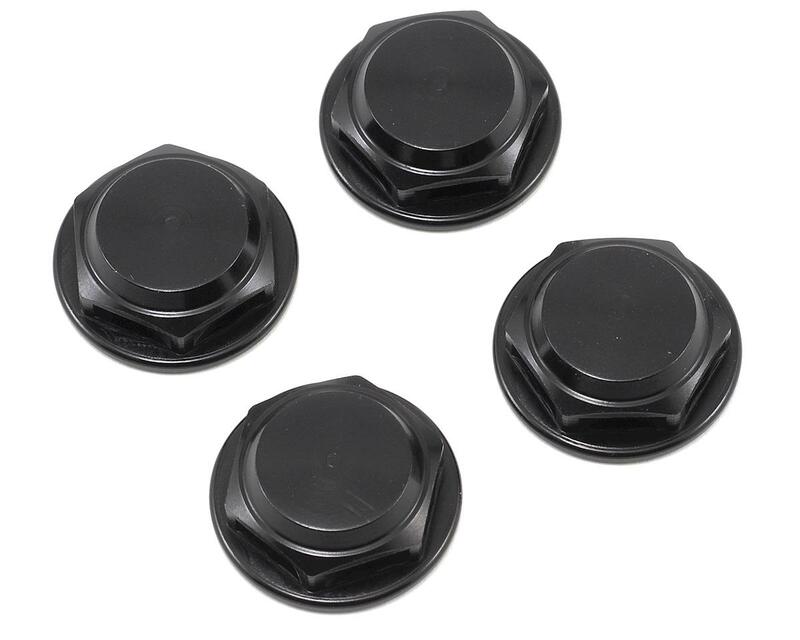 They also feature small divots in the back side of the nut that will help to lock the nut on to the wheel and help prevent it from loosening up during the course of a run. NOTE: These will not fit Jammin, OFNA or other coarse threaded hubs. Excellent product, although i've had it for months, it's still good and i've been racing hard. Our local track's pit lane has low concrete walls on the side and other nuts have been really scratched up but these were quite strong, though the paint will come off but the scractch lines are not deep meaning that the alum is stronger. The threads do not get worn or dented and are easier to screw on compared to others. One important point that made me write this comment, last weekend, i forgot to tighten the nuts for one of my qualis but my wheels stayed on. Really good product and many colors to choose. from. Those divots on the inside certainly worked their magic. They are just right, enough to ensure that the wheels stay on and not too much that removing them with require brute strength. Well made and well designed product. stay snug and look great. good cheap, easy upgrade for any 17mm. looks great on my GT2. They are amazing! Never comes loose! And you dont have to over tighten them to make them stay on. They have grip on the inside so they will stay on no matter what. Look good on my car and the closed end keeps it clean. Good product for the money, ive used them with my HB Ve8 and they do not come lose and keep the crap out of the axle grub screw. A definate buy for those looking for new wheel nuts! I have used these for 3 years. And never had one come loose. I am just getting back into nitro buggies after a few years away. And these are on the top of my list to get. They never loose thier grip. Unlike the plastic lock nut type. Well worth the small investment to never have to worry about ypur wheels coming off.